The second day of the meeting and I totally got off on the wrong foot. For those unfamiliar with DC, most of the action around here happens on the weekdays with government in business, when there are more people. So it can be difficult sometimes to find a simple breakfast place on a Sunday morning when you want something simple and won’t break your wallet like a hotel breakfast can (I just can’t approve of a $25 breakfast even if it’s expensed). Luckily I’m pretty familiar with DC (I usually come down for the Cherry Blossom Festival from Philly). So I tend to like to visit Point Chaud Cafe for a savory crepe and latte. Totally recommended. Otherwise a quick macchiato and oatmeal at Starbucks (not at the conference center, that line is ridiculous!). Anyway, I got my latte and crepe and settled into planning my itinerary for the day. I decided to take it easy since I didn’t see anything too pressing to see in the morning and figured I’d join in for the 11:30 special lecture. If there is one thing that I’ve learned in my many years of attending this meeting it’s that it is a marathon and that means you MUST pace yourself. Otherwise you’ll wear yourself out and burn out pretty quickly. There’s a lot going on at this meeting. 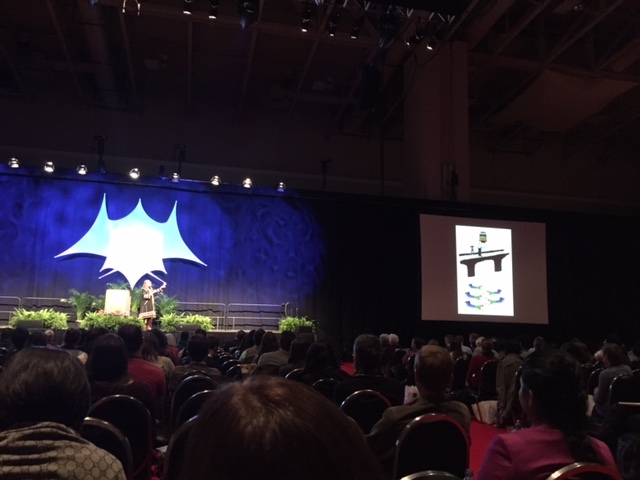 So I settle in at the lecture and SfN president Carol Ann Mason introduced the speaker… not the talk I was expecting. What?! So I grab the day’s planner and realize my mistake. I was planning for Sunday using the Monday book. And since I was trying to travel light, I only had the Monday book with me. Luckily, there’s an app for that… So I quickly downloaded the SfN meeting planner app and figured out what was going on. And the special lecture was still relevant. Crisis averted. Side-note: at the start of the 2nd day of the conference we are at 30,473 registered attendees! Well, due to my confusion I had no expectations going into this talk. But was pleasantly surprised with the topic. Dr. Banaji started off talking about how infants and children will mimic adult behavior and facial expressions and then led into philosophical dilemmas and decision making (train dilemma). The interesting twist she introduced is that our decisions change when it’s no longer people, but chimps. We are much more likely to toss a chimp in front of the trolley to save 5 other chimps than we are to toss a human into danger to save 5 humans. Why is that? She then brought up the example of Encyclopedia Britannica when approached by the young founders of Microsoft, looking scrappy and rough, suggesting that they move their books onto software. Britannica sent them packing, saying we’ve been doing well for 200 years without your crazy ideas. And Banaji suggests that their look had a lot to do with it. People much like us were very discriminating against groups of people as recently as 50 years ago, denying ethnic groups and races from admittance to top schools and jobs. And she asks, “Are we being discriminating now?” 50 years from now what will people say when they look back on our language and choices and exclusions? Banaji states “I live in fear that I miss talent every day,” referring to the possibility that she may too easily dismiss a student who doesn’t fit her image of a successful scientist. All of her heroes were male and her picture in her head of a smart person is typically male. And she’s not alone. Thousands of studies demonstrate that we are prejudiced when making decisions on resumes, audits, interviews, etc. We are totally biased. Banaji then had us run through implicit association tests to drive the point home. “Our behavior is not in line with our intentions.” We are guided by 3 uncontroversial principles: 1) associated learning; 2) bounded rationality; 3) unconscious inference. But it is up to us to be and do better. This was a panel talk focusing on the use of gaming to improve cognitive function, addictive gaming and the ethics involved. The overall conclusion appeared to be that the benefits of gaming to cognition outweigh the possible harms. But most research tends to focus on the negative affects of gaming, mainly due to media interests. But this is a very unbalanced approach. We were once told that dancing the waltz, reading books and music were evil, but we know better; gaming is no different. Cognitive benefits – One cool mention that I hadn’t really thought of was that the process of playing a video game is much like the scientific process. And it’s true! When you play a video game, you aren’t sure what is going to work. You are presented with a problem and you try different ways to succeed. This leads to changes in the brain both in practice and emotion. Emotion? Yes, practice builds networks with emotional chemicals like adrenaline, acetylcholine and dopamine. Video games engage the whole brain. But perhaps most importantly, they are forgiving of failure and it’s therefore more fun to learn, learning through engagement and discovery. So there are definitely cognitive benefits. And while it wasn’t mentioned by name, I’m sure we are all thinking about Lumosity. Another theme of the meeting was the warning that cognitive enhancers via gaming are not established and are in fact, not accepted in the community. Just last month a consortium of scientist signed a formal agreement that there is no such thing currently. So again, while buy in programs like Lumosity were not mentioned, scientists are warning against snake oil salesmen. But there is real research being done to help improve particular groups cognitive ability like the elderly. 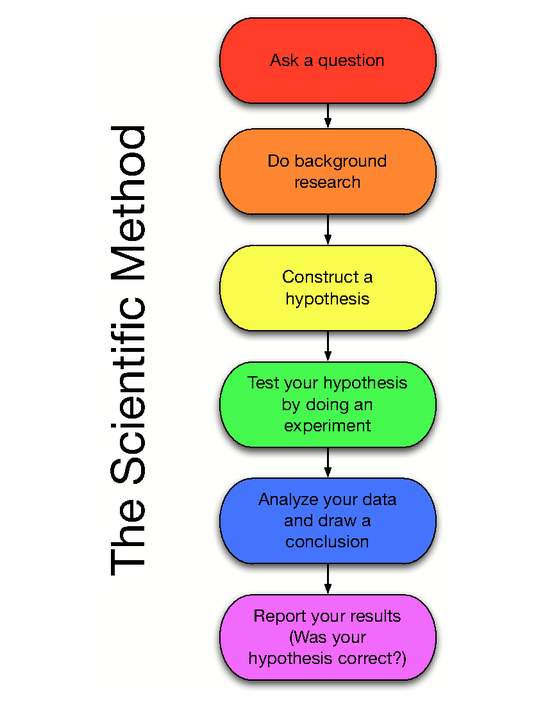 The problem with most treatments for the cognitively impaired is: poor characterization (diagnosis), poor targeting of treatments (most are blunt drugs with many side effects), nonpersonal, unimodal (ignores other avenues like physical health), it’s open loop (subjective effects that are not empirical), not good enough treatment. Video games may present a way to solve these problems if designed correctly. But gaming can also be a problem if it interferes with life, and it’s now even included in as a behavioral addiction in the DSM. So while the advantages may outweigh the disadvantages, being aware of problematic video gaming addiction is important. But, it must be properly defined, which isn’t always easy. As an industry SfN member and no longer an academic, my interests in the exhibitor portion of the meeting have changed a lot. 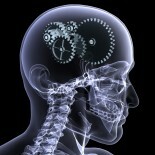 As a neuroscientist studying consumer behavior I’m looking for the latest and greatest measuring tools and software. 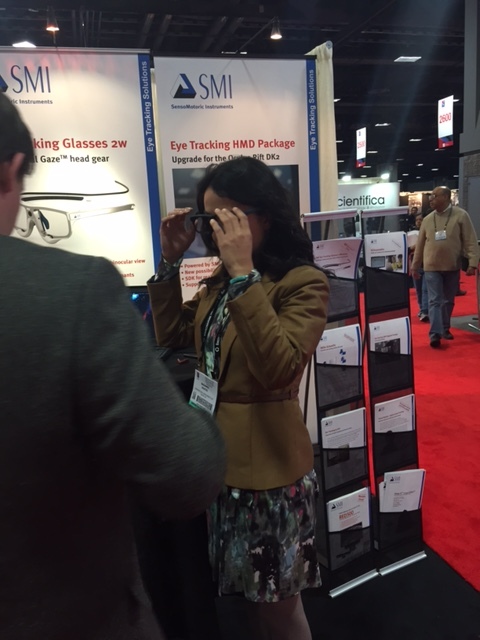 So for example, I stopped by the SMI booth to check out their new eye tracking glasses. Even got to try them on. Pretty cool. So my exhibit browsing had real purpose, while in the past it was really only for the free stuff. But getting free stuff usually also means getting your badge scanned which also means you will be getting a bunch of sales emails. So is that tootsie roll really worth it? Maybe not, but maybe that cool Leica tote bag is. Who knows. 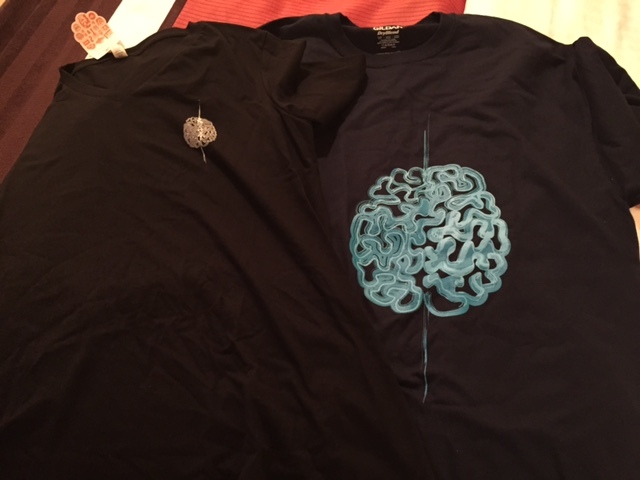 I actually bought a super cool tshirt (one for myself and one for my boss) from the Faculty for Undergraduate Neuroscience. I also picked up a fun size twizzler. 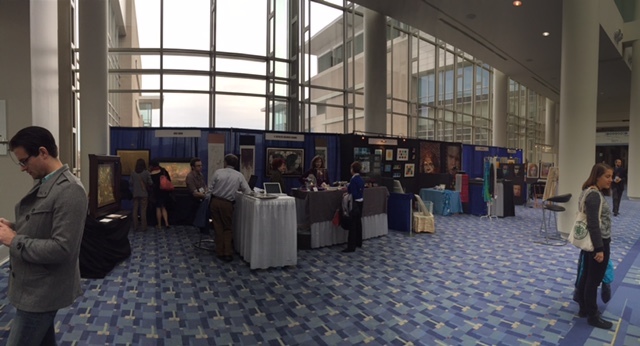 One cool addition is this fun little area next to Hall D. It’s like a neuro- art fair! I’m obviously getting old. I was super tired today. I concluded my day just as it started to rain here in DC, a cold rain. So I decided it was time for a hot bowl of pho, because seriously, Chinatown is right next to the conference center. 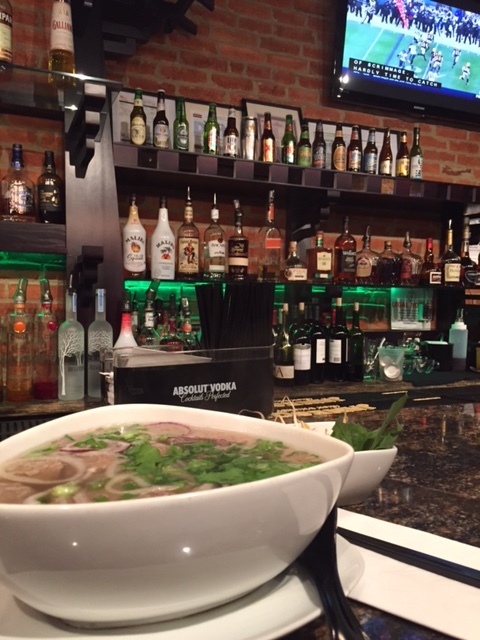 And at sitting at the bar with my pho I was able to catch the Eagles v Green Bay team. Missing Philly and my hubby. This entry was posted on November 16, 2014 by nerdoscientist and tagged conference, neuroscience.